Know of a farm who grows Ginger? Let us know! What we know as ginger is the root of the plant officially known as Zingiber officinale. For centuries it has been eaten as a delicacy, medicine and a spice. Cultivation for ginger began in South Asia, but now ginger can be found growing in East Africa and Carribean. We use it in our cooking for the fragrant warmth it brings to our dishes. – Ginger is often minced or grated and added to dishes. – Sliced and steeped in boiling water, ginger makes a fragrant and warming tea. Some add honey and/or citrus. It is sometimes taken as a cold remedy. 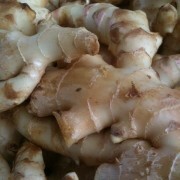 Ginger is sold in pieces called “hands” as in “a hand of ginger.” Select ginger that is firm, smooth and free of mold. Avoid any wrinkled ones. Unwashed and unpeeled ginger can be stored in the refrigerator for up to three weeks. Young ginger will last up to a only a week. Stored unwashed and unpeeled in the freezer for up to six months. The Romans began importing ginger from China almost two thousand years ago. In the Middle Ages, it spread to other regions in Europe where it was considered a very expensive spice since it was being imported from Asia. Spanish explorers and colonists introduced ginger to the West Indies, Mexico and South America in order to make it more available and to cash in on the high demand. Plantations in these colonies began exporting the herb and spice back to Europe from the 16th century.